ARE YOU A FAN OF OLD WESTERNS, WHERE THE HERO HOLDS UP A TRAIN? Grady Hughes, single parent at the end of his tether, loves those old movies, and when a train threatens, for the second time, to kill one of his valuable steers, he goes temporarily insane, stops the train at gunpoint, and lands himself in a world of trouble. He has to appear in court, undergo sentencing and deal with Fiona, the parole officer assigned to him. Fiona’s from the city, and cowboys are new to her. Fiona has never met anyone like Grady. He irritates her, but it’s his three little kids who really get under her skin. What’s she do with a modern day renegade and a trio of kids who capture her heart? ˃˃˃ A contemporary cowboy romance novel you’ll love! 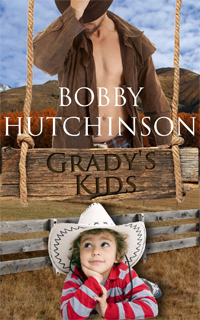 Set in the rugged Rocky Mountains of British Columbia, Grady’s Kids will keep you up reading all night. ˃˃˃ If you enjoy the cowboy novels by Amelia Rose, you’ll find this one just as captivating. My sister Karen called me one day. “You won’t believe what our cousin did,” she said. “He held up a train with a rifle because it was killing his cattle. He was on Canada’s most wanted list for a couple days, and then he was picked up. But the judge gave him a suspended sentence and assigned him a parole officer. Guess what? He married her!” Whenever readers ask how I get my ideas, I say, from my sister.